Looking for a weekend getaway? A long weekend getaway. Look to Memphis, Tennessee. From Chicago it takes eight to eight and a half hours. That's it. It is an easy and quick trip. You take the 57 South to the 55 South and head on into the great state of Tennessee. You will go through Illinois, Missouri, Arkansas, Tennessee and yet it is no more than an average workday to get to and from one of the most interesting cities in America. My original reason for heading to Memphis (and it was a long time in the making, since I've been trying to do this trip for several years) was to go to Graceland. I liked Elvis Presley, but I was certainly not an Elvisphile and I only owned two of his music collections (both greatest hits collections), but for some reason going to Graceland was on my earthly bucket list. Many things to know. Even though I left on Sunday, May 29 with a return on Wednesday, June 2, I managed to do and see more in two full days than the average tourist. Also, please note, it's hot and humid in Memphis even at this time of year and it's a bit draining if you AIN'T a heat loving person. When you go you must visit the Sun Studios for their vivid and electrifying tour. The young woman who gave the tour on Monday (Memorial Day) was a loaded gun of information. I realize that's her job, but you'd swear it was the first time she'd deliver this heavy ammo of material. I realize that's her job too, but she was a fantastic tour rep through the mighty fields of the history of Sun Studios. Johnny Cash! Carl Perkins (intensely underappreciated, if even remembered by anyone under a certain age)! Roy Orbison! Jerry Lee Lewis! B.B. King! Of course, Memphis was the home of the King of Rock n' Roll - Elvis Presley! The tour provides a heavy homage to that Tupelo born one man dynasty! I stood on the spot (yes, an X marks the spot) where an 18 year old Elvis recorded his first song (a tribute to his mom). The microphone is as it was the day Elvis Presley first walked through the doors. Great story we learned while there. Bob Dylan once came to Memphis and went to the studio and walked in only to kiss that x and then he left. Go Zimmie! The famed million dollar quartet photo was taken here in late 1956. That shot was taken after Elvis had already made it! This place is a highlight, so it's a must see for any music lover and for that matter any lover of history. Near the final stages of the handcrafted guitars at the Gibson Guitar Factory Tour. 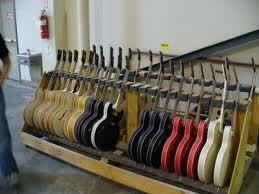 The Gibson Guitar Factory tour is quite splendid as well. The actual facility is humid due to the needs and the environment of how you handcraft a guitar. By the way, who knew? It's complicated to make a guitar! You will never look at a guitarist in the same way again. We were there on Memorial Day, so the staff was given the day off, so the tour was not noisy or wood chippy! Their artisans have built guitars for all of the giants, including B.B. King, Eric Clapton and Jimmy Page. The Peabody Hotel is quite famous in American Southern folklore tourism. As you sit and wait for the ducks to depart to their elevator it seems silly on the surface, but then the hoopla begins and it's such a lighthearted moment in life you must enjoy it and then treasure it. Be careful where you eat. Here we were in Memphis and two of their notable BBQ Rib dining establishments were closed so we ate at one of the worst rib joints ever. I ended up getting physically sick from these fatty, non-completely cooked ribs. The cole slaw was even bad. Bad cole slaw? Yes. Since we wanted to drive into Mississippi we had lunch in South Haven. We dreamed of going to Tupelo to fill out the Elvis spectacle, but we didn't feel like pushing on for another 100 miles. Now, to the best part. Graceland! I've always liked Elvis. If you love rock music you have to like Elvis. He had it all! He was a superbly gifted singer, vocalist, stylist, phraser, interpreter and he did it all with the greatest performer/entertainer gifts God ever granted. Plus, he was stunningly beautiful. The best looking man I have ever seen (even besting John Kennedy Jr.) was Elvis during the 1968 comeback special. Having said all of this I never really loved Elvis. From that rare field of pop culture icons from the 20th century I always preferred Frank Sinatra and the Beatles. Overall, their music catalogs have outlasted Presley's. Having said that, Graceland has been on that proverbial bucket list for years. 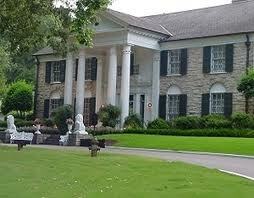 Graceland Mansion, built in 1939 and purchased in 1957 by a 22 year old Elvis Presley! Elvis loved Graceland. Graceland is more than I bargained for. The mansion itself has been left intact to exactly the way it looked on the day that Elvis Presley died on August 16, 1977. The house itself is historic on several levels, including the design. Presley authorized a remodel of the home in the mid 1970s, so it is a living example of the times. On the tour you go into the kitchen, the living room, the bedroom his parents used (his mom's dresses still hang in the closet) and of course, the famed Jungle Room. The property the home sits on is a stunning green mass of slightly inclined hills and the stables are on the property. Presley loved horses and Priscilla Presley has maintained them and from what I have read she has even gotten involved in horse rescue. God bless that effort. The best looking man God ever created. The Elvis of the 1968 Comeback special. You walk down a long corridor filled with all of the honors, accolades and gold records achieved by Elvis. It's quite touching. Many have a hard time feeling sorry for Presley, but anyone with a compassionate heart has to view it from the perspective of a lonely and sad man who had become so isolated that he clearly was miserable. Unlike Sinatra who had street sense and the Beatles who had one another, Elvis seemingly had no real friendships. He relied on a paid entourage who encouraged the concept of yes. Watching footage of Elvis Presley from the '68 comeback special you have to wonder how did he end up as this eccentric, bloated, drug addicted death machine less than nine years later. I purchased the Platinum package at Graceland (beyond reasonable rates) and with that I received the tour of the mansion (you don't go upstairs to the private quarters and the bathroom where Elvis succumbed to his death) the fashion king, the '68 comeback special, the Elvis automobile and motorcycle collections and the private planes. I came back and immediately started downloading Elvis music. Nothing better than "Rubberneckin." One of the best Elvis songs ever recorded. The man was an artist without peer. His powerhouse vocals on "Jailhouse Rock," his bluesy reality of "Heartbreak Hotel" and his pop perfection on "Kentucky Rain" will live on for years to come. The problem is I'm a little sad even 34 years later that no one helped out the King of Rock n' Roll. Go to Memphis. It's one of the best trips you will take in the United States. There is much more in Memphis than even what we accomplished in our two full days in Memphis. There is a Civil Rights Museum, a couple of other music museums, the Mississippi River Museum, the Mississippi River itself. On a completely different note, the Reverand Martin Luther King was assassinated in Memphis on April 4, 1968. The Lorraine Motel is as exactly as it was 43 years ago. We went to see the motel and to view the wreath hanging at the spot where James Earl Ray took down one of the most remarkable people of the 20th century. The Lorraine Motel. 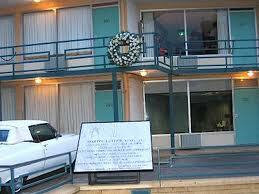 The setting of the assassination of Martin Luther King. God rest his soul.